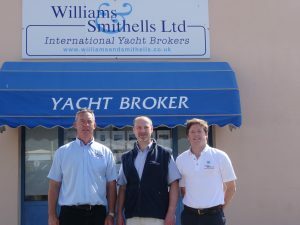 Williams and Smithells International Yacht Brokerage – Trusted and independent yacht brokers who specialise in Liveaboard Cruising & Blue Water sailing yachts as well as motor yachts across Europe with specific focus on the Eastern Med. We have offices in the UK’s central yachting haven – the Solent, Portchester, WicorMarine in England and our Ionian yacht sales base in Lefkas Marina Greece with yacht brokerage in the Preveza Greece. We are one of the largest independent British yacht brokerages in the Ionian. With our Lefkas office a permanent presence in the regions most prominent marina which is support by excellent facilities close to an International airport making inspections of boats for sale in Greece simple. Yachts sales in Preveza Marina and the Preveza Boat Yards are right on our doorstep, Cleopatra Marine, Aktio Marine and Ionian Marine. Decades of combined experience in a wide range of yachting sectors supports the sale or purchase of your yacht. There is no substitute for experience. Real Brokers, Real Experience, Real offices, Real Results, buy with confidence and trust professionals. Insured and Qualified. For new yachts we are proud and delighted to represent French builders Allures Yachting part of the Grand Large Yachting Group offering world class aluminium hulled blue water cruising yachts with lifting/centreboard keels. Professional and experienced. The brokerage team are ALL Full members of ABYA the Association of Brokers & Yacht Agents attending courses regularly to improve our range of services. Mark Ellyatt, awarded one of the first BMF/ABYA Industry Boat Sale Qualifications, was the Chairman of ABYA 2012 & 2013. 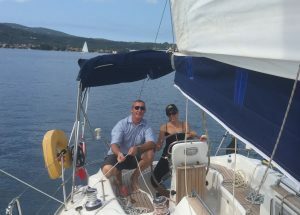 Stephen McIntosh Full ABYA member runs our Lefkas office, Jonty Stubbs manages the UK office and New Yachts .We are also members of the BMF and BRBA. Well over 1000 yachts sold by the team over the last 20 years. In 2015 we are pleased to be joined by Sarah Mikroni as our Lefkas office administrator. Sarah is based in our Lefkas office overseeing much of the important yacht brokerage administration in Lefkas and Preveza. Multi lingual, dual nationality, engineering graduate, enjoys being involved in the yachting scene.